The U.S. electric power sector consumed 677 million short tons of coal in 2016, the lowest amount since 1984. Electric power sector coal consumption accounted for more than 93% of all coal consumed in the United States, and more than two-thirds of this coal was shipped either completely or in part by rail. Most of the remainder was shipped by barge, truck, or—for power plants located near a coal mine—by conveyor. Electric power sector coal consumption in 2016 was 35% lower than in 2008, when U.S. coal production reached its highest level, but the share of coal shipped to the electric power sector by rail (completely or in part) has consistently remained near 70%. After rail, the next two most common modes of transporting coal are barge and truck. 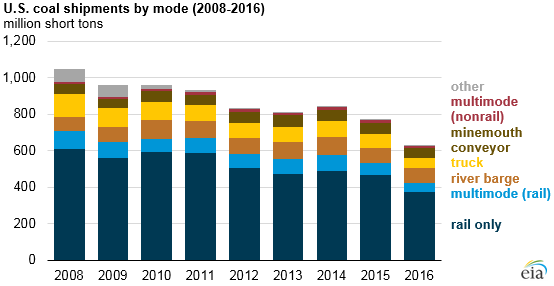 Both modes have accounted for about 10% of yearly coal shipments since 2008, but truck shipments have decreased slightly, reaching 9% in 2016, while barge shipments have increased slightly, reaching 13% in 2016. The increase in barge traffic coincides with the growth of coal produced in the Illinois Basin, which relies on shipments along the Ohio River and its tributaries for a significant portion of its production. Slight declines in shipments by truck coincide with declines in Appalachian production that supplied generating facilities a relatively short distance from the mines. Many generators receiving shipments by truck in the Appalachian region have either closed or significantly reduced their output. The cost of transporting coal can vary greatly along different routes. In addition to costs associated with a particular mode of transport, factors such as route length, availability of transport mode and supply source options, and the competition between coal and other commodities for transport can affect the transportation cost. The delivered cost of coal for all transport modes was $41.64 per ton in 2016, a decline of 6% from 2015 and the second consecutive year of declines in the delivered cost of coal. Transportation costs have accounted for about 35% of the total delivered cost of coal in recent years. More information from EIA’s coal and electricity industry surveys can be found in EIA’s summary of coal transportation rates and in EIA's interactive coal data browser and electricity data browser.